Ive been playing guitar since the age of 14 and composing for acoustic guitar since the age of 21 (Im now in denial concerning my current chronological advancement in years). My mother was a concert pianist of the conservatory ilk, my father enjoyed doodling with jazz improvisation on the baby grand Steinway after a few premium bourbons, and my brother maintains a diverse background in drumming. I began experimenting with an old plywood-composite acoustic guitar found in my fathers closetcomplete with tawdry images of flamingos frolicking on the plastic pick guard. It was a dreadful instrument with action akin to the great drawbridge across the Arthur Kill in Elizabeth, N.J. Nonetheless, I began creating melodies one string at a time until I was able to play chords. My introductory experience with acoustic guitar was so dismal that I divorced myself from the experience altogether and attempted to become a percussionist. That was a mistake. I returned to the guitar, but this time it was the electric, after being introduced to the unbridled, testosterone-driven, adolescent hedonism of distortion effects. This phase lasted until I was able to appreciate the music of Kenny Burrell, Grant Green, and Stanley Jordan. Eventually I returned to the acoustic guitar for purposes of composition without accompaniment and in response to the excitement induced via the Fahey legacy. Concerning knowledge of other instruments, I have marginal experience with keyboards and often incorporate them on albums. I am presently recording with a Roland VK-7 for B-3 organ and cello sounds. 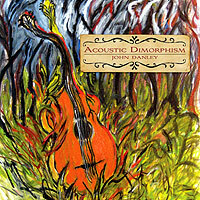 Acoustic Dimorphism represents my 8th independent solo release (released October 1, 2009). This album offers a hybrid of original, instrumental acoustic guitar music. 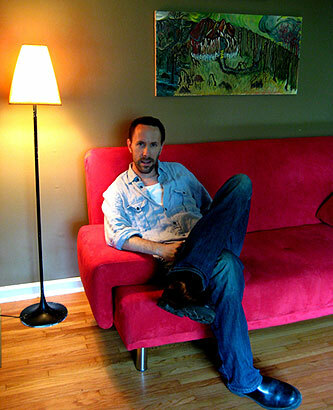 Predominant forms include neo-bluegrass, bossa nova, percussive-driven harmonies, and European ballads executed with a variety of contemporary finger style guitar techniques. My intention was to synthesize tradition with modern experimentation while incorporating a sense of humor. My favorite electric guitars will always be pre-CBS Stratocasters. They make sense from a design perspective and are extremely versatile for a variety of musical styles. As mentioned earlier, the guitar used on my album is a limited edition Taylor 714 with a cedar top and grafted walnut back and sides. Its one of my favorite combinations of tone woods. The cedar adds warmth and dimensionality to the bass register while the walnut back and sides produce ample projection, shimmering treble, and clarity of note separation. In fact, one of the best sounding acoustic guitars I have ever played was when I was asked to perform at The Healdsburg Guitar Festival in 2007. It was there I met the now deceased Lance McCollum who introduced me to a similar instrument crafted from black walnut. Lances instruments remain among the best in the world and I only wish I had been fortunate enough to own one. For the specifications fanatic, I have an Audio Electric Research amplifier and use Elixir Nanoweb light gauge strings exclusively because they are the only brand that can withstand two 45-minute sets of brutalization. Ive reduced my effects arsenal to a Boss reverb and delay pedal for fleshing out sonic endeavors when performing live, but for the most part I am a strict purist in the studio. Recently, I have been enjoying a British made compressor known as the Love Squeeze. Besides the overt innuendo, it is one of the most transparent compressors on the market and can be used as a volume boost for magnetic pickups. Keith Jarrett is my favorite musician. I prefer to listen to solo piano records if I am going to listen to anything when Im alone. The truth is that I only listen to guitar music when I am finding out what other artists are doing. This phenomenon can only be explained by a feeling of ennui after endless hours of practicing, composing, performing and recording on a stringed instrument. It is the reason why cooks never eat at their own restaurant. Nonetheless, I was bitten by the Hedges bug after the onslaught of Windham Hill in the mid-80s. David Walbert, a classical guitarist, friend and mentor could have been responsible for my love of melancholia when attempting to compose ballads. Due to the economic zeitgeist and various contextual circumstances, I have been forced into a provisional moratorium on touring (hopefully temporary). However, I continue composing and foresee future recording and experimentation with various projectsincluding the possibility of a duo with bassist Bonn Johnson.